UST ParaTinder Shoe Laces - Tinder Thread Inside, All-Purpose Paracord - Length 63” | BUDK.com - Knives & Swords At The Lowest Prices! 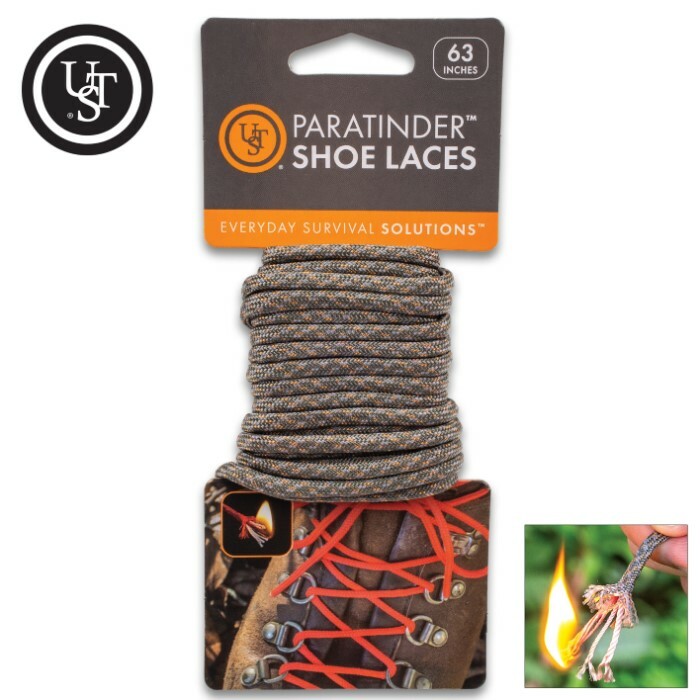 UST ParaTinder Shoe Laces feature 63” of all-purpose paracord with an added single tinder thread to ensure you always have fire tinder with you wherever you go. Paracord is the handiest survival tool you can carry with you and this is one of the most ingenious ways to assure that you have it conveniently on-hand. Before you go camping, hiking, climbing, canoeing or hunting, just lace up your boots with ParaTinder and wrap the excess around the ankle so it’s available to use as needed. As you use the cord, the laces can be re-laced to retain a secure boot fit. Make sure to seal the paracord edges with a match to prevent unraveling after trimming. To ignite, expose the red core thread and light it with any fire starter. Use the inner strands for sewing thread, sutures, fishing line and more. The 63” overall shoe laces are available in the colors orange or green camo.